Habit: Perennial herb, shrub, tree, generally fleshy. Stem: cylindric to spheric, or flat; surface smooth, tubercled, or ribbed (grooved); nodal areoles bearing flowers. Leaf: generally 0 or early-deciduous, flat to +- cylindric. Spines: areoles generally with central, radial spines, occasionally with glochids. Flower: generally 1 per areole, bisexual [unisexual], sessile, radial [bilateral]; perianth parts generally many , scale-like to petal-like; stamens many; ovary inferior [superior], style 1, stigma lobes generally several [many]. Fruit: dry to fleshy or juicy, indehiscent to variously dehiscent, spiny, scaly, or naked; tubercled or smooth. Seed: generally many, occasionally 0--few. Genera In Family: +- 125 genera, +- 1800 species: America (especially deserts), Africa; many cultivated, some edible. Note: Spines smaller, fewer (0) in shade forms; yellow spines blacken in age. Introduced species increasingly escape cultivation. Hybridization common in some genera. 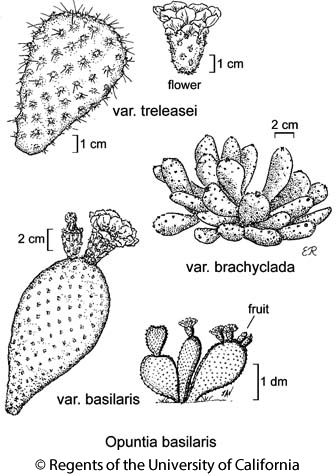 Taxa of Escobaria in TJM (1993) moved to Coryphantha. Scientific Editor: Bruce D. Parfitt, Douglas H. Goldman, Bruce G. Baldwin, Thomas J. Rosatti. Habit: Shrub, tree; roots fibrous [tuberous]. Stem: generally erect, < 6  m; segments generally flat (+- cylindric), generally firmly attached; tubercles 0 to +- developed; ribs 0. Leaf: small, conic, fleshy, deciduous, present on young stems, ovaries. Spines: 0--many per areole, cylindric or flat, tip smooth or barbed, epidermis persistent; glochids generally many. Fruit: juicy, fleshy or dry; wall thick, bearing areoles; spiny or not. Seed: in a bony, +- white aril. Species In Genus: +- 150 species: America; Opuntia ficus-indica cultivated for food, others for ornamental. Etymology: (Possibly from Papago name ("opun") for this food pl; or for a spiny plant of Opus, Greece) Note: Spines smaller, fewer in shade forms; yellow spines blacken in age. Spineless stems, ovaries, and fruit generally with glochids, these occasionally long, conspicuous; hybridization common. Taxa with cylindric to club-shaped stems moved to Cylindropuntia, Grusonia. Habit: Shrub. Stem: 7--40 cm, branches sprawling to ascending or erect; segments 5--21 cm, green to +- blue, generally papillate-puberulent. Spines: generally 0(8) per areole, glochids many. Flower: inner perianth +- 4 cm, pink-magenta; filaments deep magenta-red; style white or pink, stigma white. Fruit: 2--4 cm, dry in age, green and purple becoming tan, generally puberulent; areoles 24--76. Seed: 6.5--9 mm, +- spheric. Stem: segments 8--21 cm, 5--13 cm wide, flat, +- obovate. Spines: 0. Chromosomes: 2n=22. Citation for this treatment: Bruce D. Parfitt 2012, Opuntia basilaris var. basilaris, in Jepson Flora Project (eds.) Jepson eFlora, http://ucjeps.berkeley.edu/eflora/eflora_display.php?tid=62539, accessed on April 20, 2019.
s SN, Teh, SnGb, SnBr (and adjacent SCo), e PR, s SNE, D; Markers link to CCH specimen records. Yellow markers indicate records that may provide evidence for eFlora range revision or may have georeferencing or identification issues. Purple markers indicate specimens collected from a garden, greenhouse, or other non-wild location.